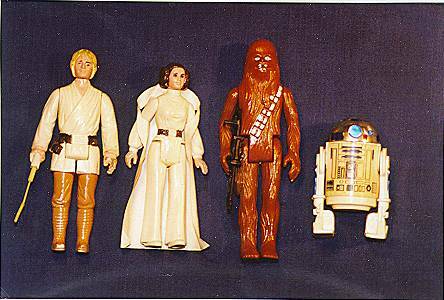 Thought to be the actual figures used in Kenner's marketing photography for its Early Bird mail-away promotion, the above pieces are first shots of the first four commercially available Star Wars figures--Luke Skywalker, Princess Leia, Chewbacca, and R2-D2. 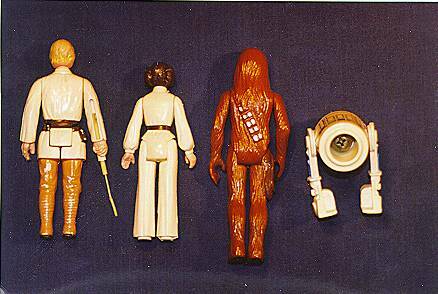 As you might be able to tell from the photos, the figures differ slightly from their production counterparts: Luke's saber, for instance, has a thicker tip, and the slot in his arm is significantly thinner; Leia's cape is of a different material and cut; R2-D2 has a larger screw visible inside his cylindrical body; and all four figures lack production markings. The paint used on these prototypes also differs from that used on the final toys--it is rubbery and doesn't adhere well to the figures, qualities which have caused it to peel off over the years as the figures were passed from hand to hand. Lastly, the figures' torsos were never sonic-welded together, but rather were glued by hand, an imperfect process which left a small gap between the two halves of each of the humanoid figures. Generally, first shots offer little beyond a slightly-altered duplicate of the production figure; in this case, however, the historical significance of the figures themselves--as the first Star Wars figures the public saw in ads and catalogs --makes this a very special set of first shots indeed.